Fifty years together in Tanzania for health for all. On Tuesday, June 26, Doctors with Africa CUAMM celebrated a special event at the Italian Ambassador Residence in Tanzania: the 50th anniversary since it started working in Tanzania. Always side-by-side with Tanzanian health personnel and in collaboration with hospitals and local authorities, CUAMM’s presence has been constant and its commitment long. To mark this bond of respect and collaboration, Leonard Subi, deputy of the Ministry of Health, attended the celebration on Tuesday, June 26 in Dar Es Salaam, together with the Italian ambassador, Roberto Mengoni and the President of the Tanzania Episcopal Conference and Bishop of Iringa, H.E. Msgr Tarcisius JM Ngalalekumtwa. There was also Mauro Brero, Chief of Nutrition to UNICEF in Tanzania and, from Doctors with Africa CUAMM in Italy, the director Don Dante Carraro will attend. 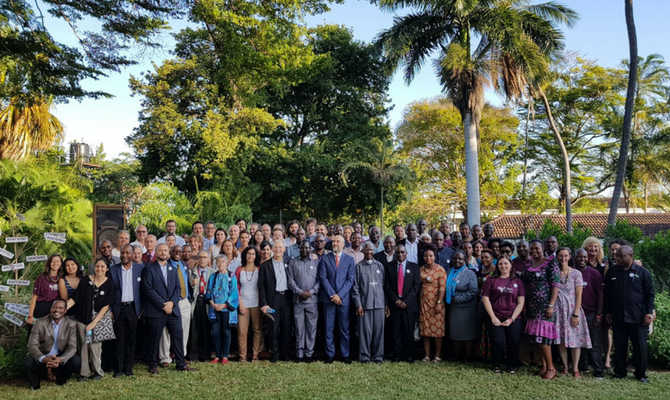 Members of CUAMM staff in Tanzania came together from around the country in the capital city for a celebration that hoped to become a real occasion to revitalize CUAMM’s action in the country. It was 1968 that Giovanni Dall’Olmo, the first CUAMM doctor in Tanzania, started to work in the Ikonda hospital in the Njombe region. Doctors with Africa CUAMM has been active in Tanzania ever since, extending its action to the hospital of Tosamaganga, where it is active to this day, and to many regions of the country, including Dodoma, Iringa, Njombe, Singida, Shinyanga, Kagera, Mtwara, Ruvuma, Zanzibar, and Pemba. Over fifty years, 315 doctors have come to Tanzania with CUAMM, which is now in Dodoma, Iringa, Njombe, Morogoro, Ruvuma, Shinyanga, and Simiyu, with 140 professionals, including doctors and aid workers, of both Tanzanian and European origin. CUAMM’s primary fronts of action are the fight against malnutrition and HIV/AIDS, and since 2012, it has been implementing the “Mothers and Children First” program that seeks to give all women the right to an attended birth, as well as health and nutritional support for women and their children from the start of pregnancy through the first two years of the child’s life. In the northern regions of Shinyanga and Simyu, CUAMM is also heading a national pilot project to make sure the “test and treat approach against HIV/AIDS is applied so all HIV-positive people start treatment immediately after testing positive and not only when their health deteriorates, as happens in much of Africa today due to limited resources. Throughout this last year, 4,350 patients started antiretroviral therapy, and 11,956 births were attended in the facilities supported by Doctors with Africa CUAMM. On the front of the fight against malnutrition, 1,265 patients have been treated for acute severe malnutrition and more than 117,000 have been diagnosed with moderate malnutrition.